Zhuhai Gree Daikin Precision Mold Co., LTD. 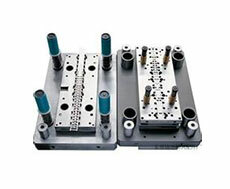 The molds type include cold runner mold, hot runner mold, Specular injection mold without flow mark etc. The Max. Dimension for precision injection molds is 2500 mm(L)X 1800 mm(W) X 1200(H)mm with 2500T. The molds type include cold runner mold, hot runner mold, Specular injection mold without flow mark, multi-color mold and inserted mold etc, which with shorter delivery time, higher quality and stable mass production performance. Including single step die, progressive die and complete automotive transferring die ect. The Max. Dimension for precision sheet metal press die is 4300mm(L) X 1500 mm (W) X 600 mm (H) with 25T die weight and 800T tonnage stamping machine, including single step die, progressive die and complete automotive transferring die with high quality and high efficiency features. Including fin die, Stator And Rotor Progressive die and IPM embossing die etc. The Max. Dimension for high precision sheet metal press die is 2200mm(L) X 1500 mm (W) X 300 mm (H) with max. 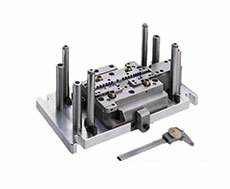 5T high precision high speed progressive die. The press speed can reach 250 times/min, and the accuracy of form and position can reach to ±0.002mm, including fin die, Stator And Rotor Progressive die and IPM embossing die etc. Advanced imported machining equipments with famous Japanese brand : WAIDA Optical Profile Grinder, OKAMOTO Internal & External Cylindrical Grinder, Mitsui High-tec Surface Grinder and CNC Grinder and KURODA Forming Surface Grinder etc., whose accuracy of the machining can reach ±0.001mm. Meanwhile, the Carl Zeiss CMM and ZHAOSCHNEIDER Coordinate Measuring Machine ensure the machining precision. "My position is the most ordinary one, and my hands is the most cherish weapon for supporting the family's living. I hope that each part send out from my hand will be the perfect artwork. " 45°Angle of sand paper burnish, showing the meticulous skill with Pure manual polishing process; 25% the secondary grinding time decides the affection of eliminating grain of mold's surface. When the surface roughness reaches to μm level, it will be like a real mirror. 02Exquisite StrategyProduce boutique molds to strengthen the country construction. [Accuracy Capacity] The machining tolerance can be up to ±0.001mm for high precision parts, ±0.01mm for injection molds and sheet metal dies, and ±0.002mm for precision sheet metal dies. [Equipment Capacity] Full range Japanese imported equipments with famous brands Makino, Mitsubishi and Toshiba. The tolerance can be up to ±0.01mm. 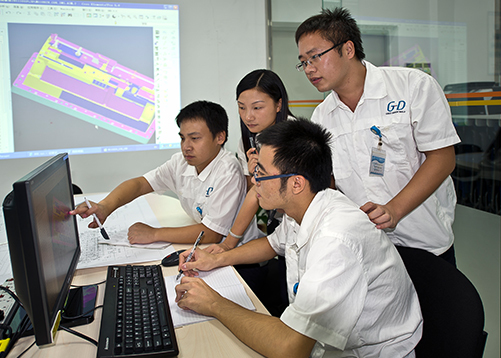 [Design Management] Advanced parallel design technology with CAE/CAD/CAM, shorten 1/2 delivery time. [Internal Logistics]U shape layout reduces waste of process flow, creating a convenient and efficient logistics environment to realize standardized logistics management. [Planning Management] Advanced APS planning system and ERP system, distributes and monitor manpower, equipment and material reasonably. [Machining Management] Optimized machining technology and widely-used CAM automatically, increase machining efficiency and shorten time effectively. 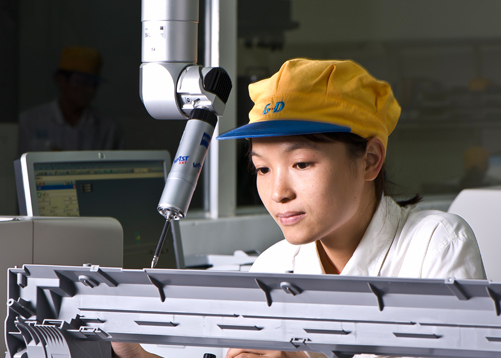 Established standard quality control system and special quality management department to ensure the quality with high precision testing facilities combined with automated testing method and standardized control processes on incoming quality control(IQC),forming quality control(IPQC) and output quality control(OQC). To display the lastest technical achievements and strengthen mold’s international technology exchanges, GDM will attend upcoming MOULDING EXPO 2017 (International trade fair for tool, pattern and moulding making) in Germany during May 30th –June 2nd, and the booth No. is No. 4 Hall, 4E52. Gree Daikin order assignment in semi-year of 2014 is completed with excessiveness , moving to the new development stage. 30 years of sheet metal stamping technology, dreaming to provide free product optimization GDM home making 2R0.5 tool, improving 60% processing efficiency in precision parts Four ways affecting cold pressing mould life GDM’s obvious advantage in large mold process Three indispensable points for choosing precise mould industry High quality and precision mould have closely relation with property of material. 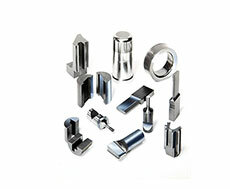 Today GREE DAIKIN PRESICION MOLD manufacturer bring us to indentify precise mould and general mould.